I was a bit ashamed to pick this novel up from my shelf, only to realize it was an ARC dated back to 2011. Oops. I was busy, okay! Amy Goodnight is the one non-witchy girl in a family full of witches and so she's made it her job to keep her kooky female relatives from letting their various magical cats out of their respective magical bags. Even though her own sister, Phin, could give two bagged-cat farts about the secrecy of her witchcraft-related experiments. Anyhoo, Amy and Phin are spending the summer taking care of their Aunt Hyacinth's farm (she's a botanical soap witch, for reals), when Amy runs afoul of the Hot Cowboy Neighbour, Ben McCulloch. Rumours of a ghost on his property have been hurting his family business (especially after a few of his workers are mysteriously injured on the job) so of course he blames the witchy Goodnight family for spreading those rumours. The only problem? Amy spots a real ghost, and when her paranormal encounter coincides with the discovery of human remains on the McCulloch land, she realizes all the weird accidents that have been happening to Ben's workers might not be so accidental. She just has to convince Ben the ghost is real, and enlist her witch sister's magical help, all the while trying to hide the fact that magic is real. While this novel was charmingly written (Amy has a hilariously cynical narrative voice), it turned out to be lighter than expected. In several ways. First of all, the story is not as dark as the description led me to believe. It's very much in the Nancy Drew/Scooby Doo vein of Meddling Kids vs. Incompetent Adults. Secondly, for a novel whose protagonist is from a family of witches, there's not that much magic in it. There's a potion or two, one hilarious scene with a magical bottle of shampoo, and a ghost-detecting machine that Phin builds, but the fantasy in this story is strangely absent and doesn't really affect the plot. Most of the plot happens due to non-magical teenage detective work, which was a bit of a let down. It's not terribly written, and the pacing is decent, but the back cover copy promises a story that the novel just doesn't deliver. It's light-hearted fluff, so if that's your thing, go ahead. 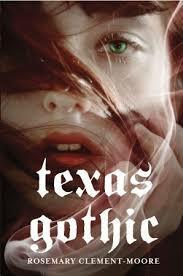 Do Not Read If: You expect an actually dark and gothic novel; you're looking for an explicitly magical plot involving spells; you hate Hot Teen Cowboys; you hate dogs; you hate ghosts; you hate goats; you hate storylines that hinge on someone hearing "goats" when the speaker meant "ghosts."